Ideally a healthy diet and exercise should keep off those extra pounds from our body. However, many times no matter how much we try, it gets even more difficult to remove those extra fats from some of the specific areas. Stubborn fats from lower back areas refuse to go away. Fat on your back can prevent you from wearing your favorite clothes and you are required to make custom-made clothes. In such situations, back fat liposuction seems to be the easiest way to keep that extra pouch from your body away. Liposuction from the back and waist are usually performed with combination with liposuction of the abdomen as well as other areas. The process of Lipostructure is used to remove the extra bulges from the back, which respond well to the patients of all ages. The liposuction removes the stubborn fat that becomes resistant to normal diet and exercises. The process of surgery starts with after giving anesthesia to the patients. After that, the suction tube is inserted through the incision made, usually incision is made in inconspicuous areas. Tumescent liposuction is an injection of the composite fluid that is being used in the surgery to reduce the bleeding and facilitating liposuction. The surgical process is used to conceal the bumps in your back. All candidates of back fat liposuction should have a good health and should not be extremely overweight. As you consider surgery, one should debate whether they are in good health to stand the surgery. Although, the recovery is quick but proper doctor’s advice and medication should be followed for the surgery to heal in no time. The recovery period of the back liposuction process is quite quick. However, the patient will have to take proper rest and care after the surgery. Proper diet should be followed. Some patients may have to wear a compressing garment while in bed. After surgery, the patient might feel a little pain and soreness, which is quite normal and will fade away in matter of some weeks. 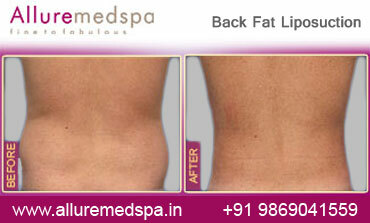 At Liposuction Center- Alluremedspa, The surgery will help you to achieve the figure that you always wanted. You no longer will have to deal with unseemly fat on your back. An experienced Cosmetic Surgeon like Dr. Milan Doshi will help you to regain the confidence and feel beautiful all over again. Allure MedSpa which is renowned for its state-of-the-art internationally acclaimed services,offers affordable and cost effective cosmetic procedures. To know more about the cost of your procedure request a consult by filling the form below. Your consultation is your chance to ask questions about Back Fat Liposuction studies and put your mind at rest. Your surgeon will be able to offer you full explanations and answers to all of your queries. It is a very safe surgery. First consult a surgeon to enquire about its effects and side effects. Dr. Milan Doshi will discuss about its side effects during the consultation process. What is Back Fat Liposuction? When we put on weight, we tend to gain the weight on the back area of our body, which is difficult to shed. Fat on your back can prevent you from wearing your favorite clothes and you are required to make custom-made clothes. It gives you an ugly look and your clothes get difficult to even fit you. 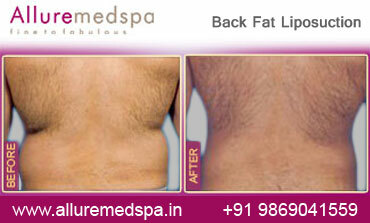 In such situations, back fat liposuction seems to be the easiest way to keep that extra pouch from your body away. How is Back Fat Liposuction performed? The process of surgery starts with after giving anesthesia to the patients. After that, the suction tube is inserted through the incision made; usually incision is made in inconspicuous areas. Tumescent liposuction is an injection of the composite fluid that is being used in the surgery to reduce the bleeding and facilitating liposuction. The surgical process is used to conceal the bumps in your back. Who are the candidates for Back Fat Liposuction? What is the cost of Back Fat Liposuction?